Scientician: A low Alcohol Christmas. This year, I have to stay sober for Christmas. I'm the on call technician, so I be sober and clear headed to have the wits about me to "turn if off then on again". 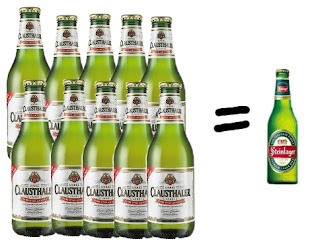 My favourite low alcohol beer is Clausthaler. You can get 4 packs at Foodtown and Countdown for around $7. there are 0.5% alcohol each. I can drink ten of these before reaching the equivalent of one standard beer. You may be thinking, yeah but whats the point if you can't drink alcohol, why bother with the poor cousin low/no alcohol? I actually like the taste of beer! I would quite happily have one of these for lunch, if it didn't look so dodgy in a hospital cafeteria. I know a lot of people would stick to orange juice and coke, but do like the flavour of alcoholic beverages and not just the getting drunk part.